Occasionally, I like to use this space to explore some of the larger implications of Montessori education, and what better time to broaden the conversation than the start of a new year? Over the last few years, more and more parents are taking the time to explore the specifics of the Montessori Method. The stunning shift in the availability of information, and the increasing speed with which the curious can find articles and videos on Montessori have had a significant impact. The other factor prompting deeper explorations is the sense that a Montessori education may be “right for the times” all the time. As national attention has been turned toward questions of education priorities and how our education culture compares to those of other nations — this recent slideshow from Business Insider offers a great overview of the highly successful model in Finland — the Montessori Method is being “discovered” by the popular media. 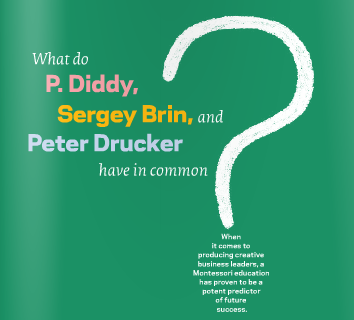 Last month (December 2012), the executive placement firm Korn/Ferry published their own discovery of Montessori in their internal publication, Briefings. In conjunction with The Montessori Foundation’s Tomorrow’s Child, they have agreed to make the full article available to the Montessori community. The article is available here or by clicking the image above. I highly recommend it. The writer, Glenn Rifkin (along with photographer, Asia Kepka) offer insight into the strengths of Montessori education and the increasing number of entrepreneurs who, when asked about their success, credit their years in Montessori classrooms. Let me know if you would like to discuss the Rifkin/Kepka article. Wishing you all a wonderful January!